This is the third book from Ishiguro that I have picked up. Before, I have read Nocturnes, which was a short story collection, and Never Let Me Go, which was a dystopian novel. I remember liking both of them, so I opted to pick up another book of his. After spending some time reading this, I find myself hating the main character, but then that just impresses upon me the fact that I really love the writing style employed in this novel. This is a novel that has a central main character, Mr. Stevens. He is a butler in Darlington Hall, and in the present timeline, he is taking a roadtrip in England, upon the suggestion of his American employer. While he is on the road, he reminisces upon his life as a butler for Lord Darlington, his previous employer, during the years in between the wars. And he also recalls his time and encounters with Miss Kenton, the house-keeper. See, Mr. Stevens is a character I hate because of his overall attitude. If I were to guess Mr. Stevens' political leanings, I would not be surprised if he were a conservative. See, Mr. Stevens firmly believes in tradition and dignity; his flashbacks about the art of being a butler actually revolves a lot around the topic of how one can be a butler and be dignified. Mr. Stevens doesn't think; he just follows the rules and the scripts that are in play when it comes to serving the people who employ him. And what annoys me is that Mr. Stevens fools himself into thinking that he has been serving humankind for the better by following the orders of his employer, who has been meeting with people important with respect to world politics. Around him, Mr. Stevens has met villagers and townsfolk who have been impressed by the fact that Mr. Stevens has served the likes of Prime Minister Churchill, among others. But seriously, he is just a butler. In my opinion, he was just a robot, following a set of social mores and norms, acting out his daily life without actually thinking. What I hate about this character was exemplified by the passage between Mr. Stevens and Mr. Cardinal, who dared to question the actions of Lord Darlington. Mr. Stevens on the other hand was willing to turn a blind eye and ignore such actions, just because he is convinced that he is not in the position to question such matters. I don't know. I really don't care much for tradition. And Mr. Stevens is one who does, a lot. He has theories about dignity, about what makes a great butler, and about the value of tradition. But seriously, tradition is for museums. And so are the attitudes of Mr. Stevens. Somehow, I find the personality of Mr. Stevens as a stand-in for older generation English folk; I know I am stereotyping here, but seriously, sometimes I think that the English population could do a little bit more by loosening up and stopping with the Victorian mores and rules of society. Anyway, I should say that I really love how this novel was written. There are two timelines, the present, as well as the past, narrated through flashbacks. And it becomes a comedy of manners, that while it doesn't go into the farcical, still provides enough comic relief even though the overall tone is one of seriousness. 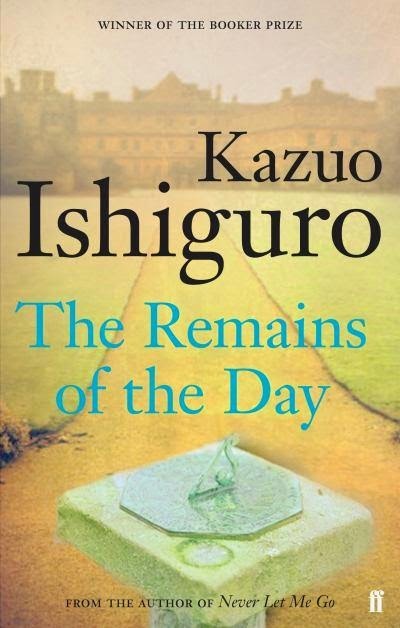 I have to say that Ishiguro makes a very good narrative here, and I am surprised that there are even some critics who want to pigeon-hole him into being categorized as a Japanese writer, when this book definitely seals him as one astounding British writer. Overall, I loved reading this book. I hated the main character, but the fact that Ishiguro made me hate the main character only made me like the book more. It shows that he has mastery of English manners and traditions, and he made use of it to convey a sentiment that while I find myself hating it on the one side, I also find myself enjoying the overall reading experience, which I gladly would love to recommend to others contemplating to read this book.